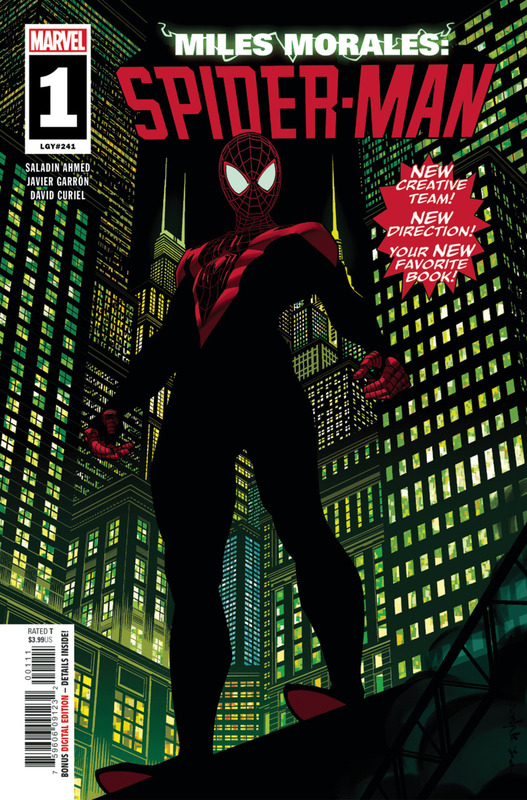 Miles Morales: Spider-Man #1 – I was a little unsure as to what Miles’s future might be like without Brian Michael Bendis, but I think Marvel made the right choice in giving this title to Saladin Ahmed, a rising star in the comics world. Ahmed gives us a nice recap of Miles’s adventures, maintaining most of what Bendis did with the character, while choosing to ignore a few details (I guess working for Cable is out of the question now), and establishing Miles as someone who feels the same sense of responsibility that makes Peter Parker great, without fully understanding where the boundaries to that responsibility are. Sure, he knows to pull people out of fires, and can’t swing past a high-tech robbery without stepping in, but is beginning to question his role in a nation that separates families at the border, and where so many are going hungry. I like how Ahmed makes Miles part of the real world, while still throwing down with the Rhino. Javier Garrón is a good choice as artist for this book, as he does have a good sense for drawing youth, and his art is pretty dynamic. I was a little confused that Miles’s friend Judge doesn’t know about his Spider-Man identity – I’m sure he knew about it at some point – but that is probably my only complaint. Miles is a terrific and likeable character, and it appears that he is in good hands. Cemetery Beach #4 – Warren Ellis and Jason Howard continue to have a good time with this book, as our heroes continue to try to escape the Earth colony where one of them has blown his recon mission. This means more flying skiffs, explosions, and weird characters as he breaches another of the colony’s ringed communities. It’s a fun, exciting series, that doesn’t require as much thought as the typical Ellis title. Dead Kings #2 – Steve Orlando’s new post-Russian science fiction take on a variation of the ‘hero’s journey’ continues, as his main character goes in search of his imprisoned brother. This book deals with a lot of the same themes as the recently completed Crude, also written by Orlando, in that it is about a straight character looking to avenge or free his LGBTQ identifying family member, and taking on all manner of mean and angry Russians to do it. This book is drastically different in every other respect, but it’s curious to see this recurring theme so soon. This title also reminds me of the great Wildstorm comic The Winter Men, with its robotic suits and general sense of despair. I like it. 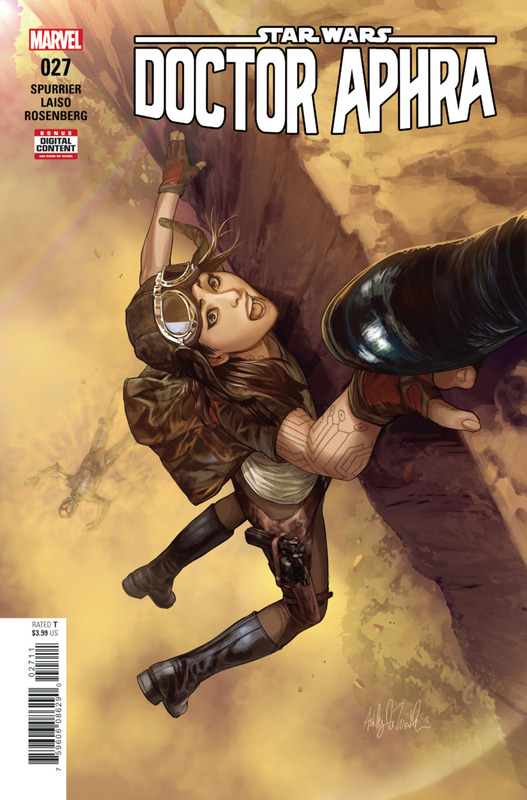 Doctor Aphra #27 – Aphra never catches a break, does she. She’s in danger of exploding in hours if she doesn’t find someone who can disconnect the bombs that are linking her to Triple-Zero. That means she has to convince the droid to not try to kill anyone for a while, while still ducking a large number of people that are looking to kill her, including a certain pair of monster hunters we last saw in the Annual. This book is always fun to read. Infinite Dark #3 – Things are getting weirder in this series, as it moves more into horror, and it becomes clear that, after the Heat Death of the universe has obliterated all but a single human space station, there really is something lurking outside. This book has a lot of potential, and I feel like writer Ryan Cady is going to reach it as this series continues. 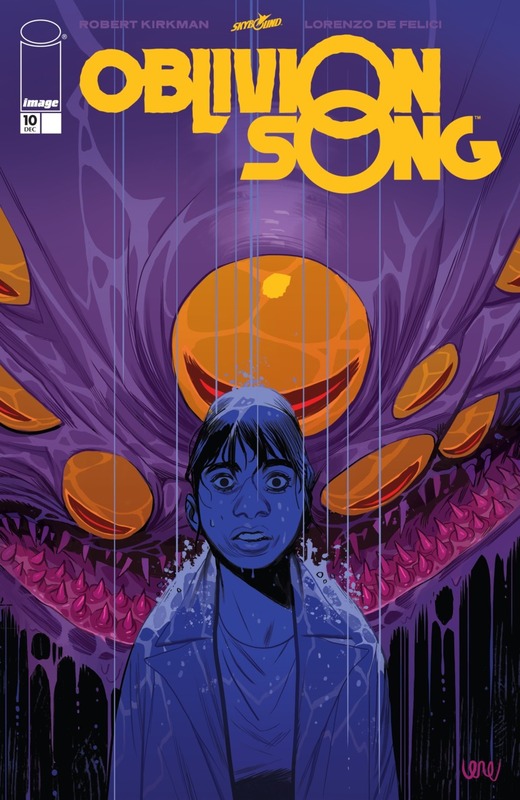 Oblivion Song #10 – My favourite thing about this series so far has been how unpredictable it is, with Robert Kirkman tossing curve balls at the reader every few issues. 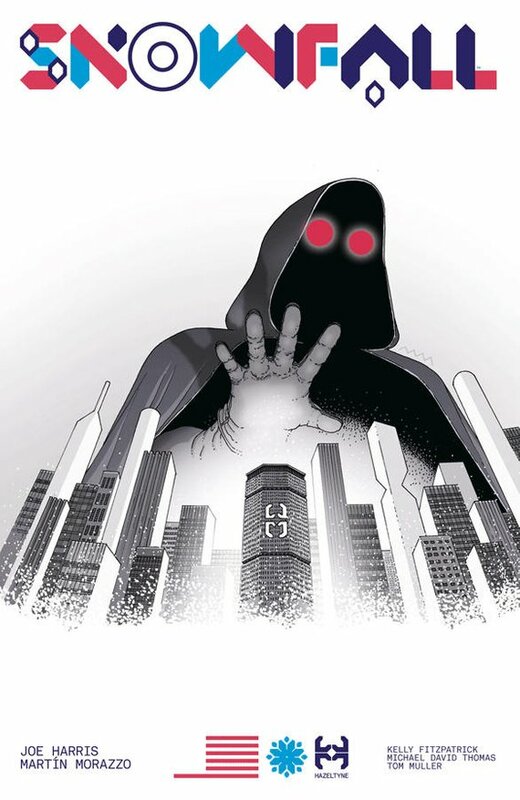 Last issue, Edward activated the device that swaps chunks of land with places in Oblivion, resulting in a few blocks of Philadelphia being moved into that hostile world, while a whole bunch of critters (really, more than should be expected) are now loose in the city. Nathan works to fix it, but has to deal with his brother’s conviction that he’s done the right thing, and some giant creatures that want to eat him. This book is likely to never get boring, is it? Outer Darkness #2 – John Layman and Afu Chan’s new horror science fiction series is right up my alley. I love how the Captain of the Charon, Joshua Rigg, is such a jerk, and how the various members of his command crew all seem to have their own agendas and plans. Layman has cooked up a very strange world – think of Star Trek if Gene Roddenberry was a goth with a sense of humour – and it’s going to be a lot of fun to explore in future issues. This is a book to watch in 2019. Uncanny X-Men #5 – We are now halfway through the X-Men Disassembled event, and the team still looks pretty assembled, aside from the fact that the younger members are not happy with how they’ve been treated. X-Man goes a little further in executing his plans for the world and in revealing how naive he still is about how things work, while the various factions of the team work to combat his Horsemen, leading to a familiar moment for Angel. This stuff has been fine, but I was hoping that something more momentous and exciting would be happening here. There was a lot of hype for this series and how it’s supposed to make the X-Men prominent again, and so far, I’m just not seeing it. 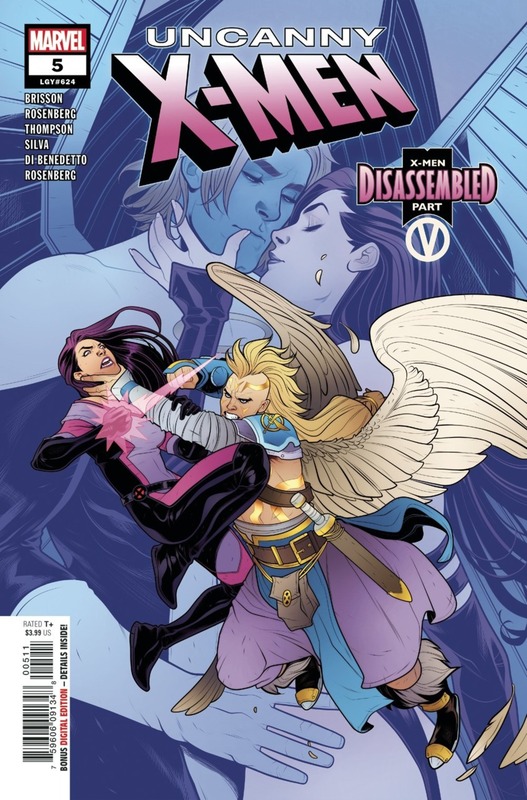 X-Men Red #11 – Jean leads her X-Squad, the Avengers, and the Atlanteans in an assault on Cassandra Nova. This is a good ending to a good series, but it’s bittersweet. I’d rather see this book continue over Uncanny X-Men, as I feel like Tom Taylor did a better job than most of capturing the sense of this moment and translating it into superheroics. Also, I’d like to have seen him have more time with Jean, Nezhno, Trinary, and of course, X-23 and Honey Badger. I imagine that Trinary is going to be one of those characters we never see again. This was a title with a lot of potential, and I’m going to miss it. 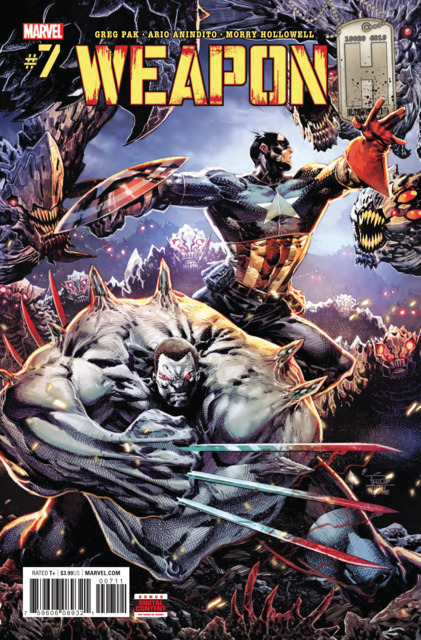 Weapon H #7&8 – Greg Pak is a pretty undersung writer, who really understands what it takes to put together a solid superhero comic. While nothing about Weapon H blows me away, it does consistently entertain, as Pak builds an unlikely supporting cast (Korg, Titania, Man-Thing) around the Hulkverine, the most derivative character ever. It shouldn’t but it works very well, especially since it’s the only book that acknowledges Weirdworld, an idea that really fizzled out. There is no better partnership in comics today than the one between Ed Brubaker and Sean Phillips. Their collaborations are always great to read, and push the boundary of whatever genre they choose to work in, be it crime, horror, or any combination of the two. 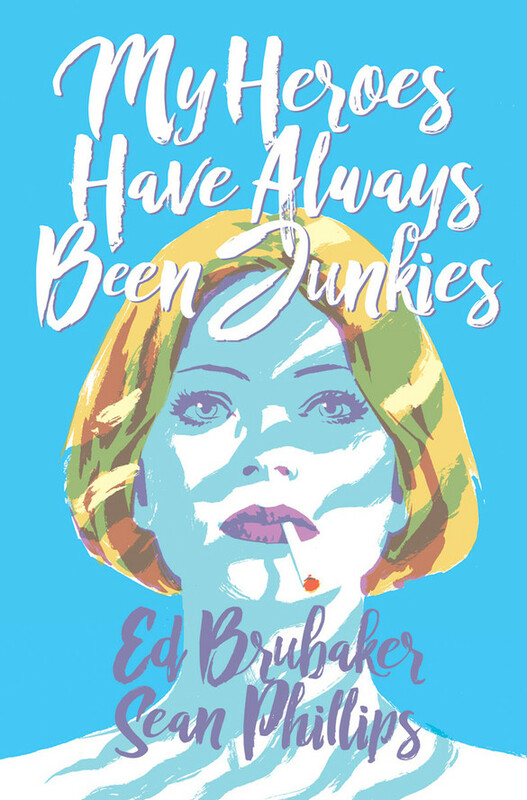 They are probably best known for their crime book, Criminal, which they are going to be returning to on a monthly basis very soon.First, though, they published this Criminal novella, My Heroes Have Always Been Junkies. It’s the story of Ellie, a young woman who has spent her life on the margins of society. Highly intelligent, she’s always been drawn to the subculture of street drugs, idolizing musicians and writers who used heroin to fuel their creative fires. In this slim hardcover, Ellie has been sent to a rehab clinic, where she meets and falls for Skip, a young man who is serious about getting clean, and who is holding on to a few family secrets. Ellie knows that she is going to be trouble for Skip, but she can’t quite help herself, and soon the two of them are on the run, and trying to figure out their next steps. At least, that’s what it all seems like on the surface, but because Ed Brubaker is writing this book, there’s a lot more going on than just that; I just don’t want to spoil things for anyone. As is always the case, this book is a great character study, and examination of the mind of people who live on the edges, and have to live with the harm they cause. There is a reticence to Ellie from the first page that makes her a very interesting character, and maybe not the most trustworthy narrator. Phillips and Brubaker work beautifully together, complimenting one another’s strengths perfectly. 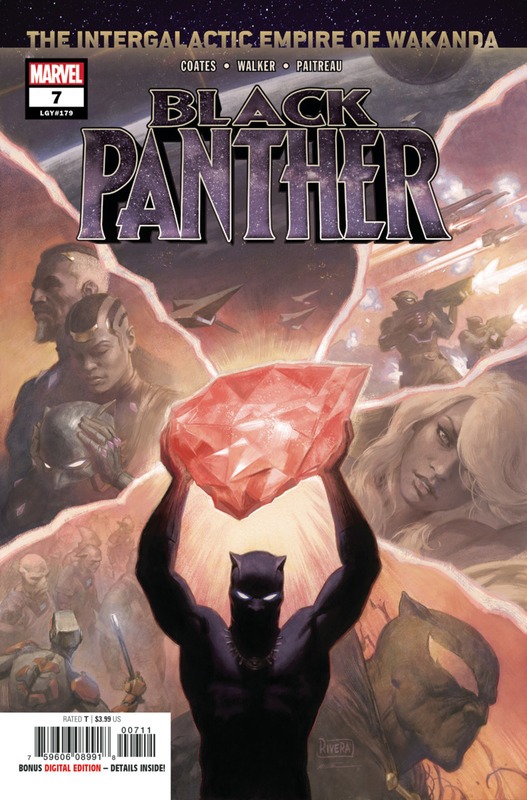 This book is coloured by Jacob Phillips, not their usual collaborator Bettie Breitweiser. Phillips uses more pastel watercolours, and especially in the daylight, gives the book a more optimistic feel. This was a great comic. I’m excited to see what the duo has in store for us with their new Criminal run, and I’m curious if we will see Ellie again. Snowfall – I liked The Great Pacific, Joe Harris and Martin Morazzo’s previous collaboration, but this one just didn’t work for me. It’s a post ecological disaster comic, so it’s pretty relevant, but the story is never very clear. There’s a guy who has developed some sort of weather control technology, but he’s a terrorist. Somehow, his daughter has become one with the technology or the atmosphere or something, and I found I was never all that clear on what was going on. Maybe I just missed some key details early on, but once I was out of the story, I was never able to force my way back into it. It was disappointing.